Here I am in 1970! I worked with San Jose State College (now University) students to make the five-day "Survival Faire" happen two months before the first Earth Day. I organized and publicized the art exhibits that were part of the week's activities and recruited Philip Linhares to judge the exhibits;. He was enthusiastic about the quality of the art, which addressed environmental issues. The week's most remembered event was the sacrificial burial of a brand new car. It was never driven; we pushed it the full distance from the sales room. Two students pose for a photograph and are shown holding a large bag of rice from a truck. On the side of the truck is a sign that reads: "San Jose State Survival Rice." According to a press release dated 21 January 1970, Humanities 160, Contemporary Issues, organized a Survival Faire at San Jose State College, February 16-20. The purpose of the faire was to raise awareness to the college community and broader public on the problems of environmental survival. The Faire sponsored a week of activities that included events, exhibits, speakers, panels, workshops, films, exhibits, plays and a funeral procession and a nine hour wake to celebrate the burial of a 1970 car, among other events. See Civil Rights and Campus Protest Collection, Box 3. 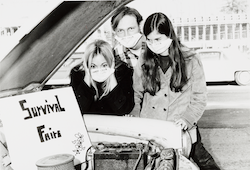 At right: Three students wearing face masks standing over the open hood of a car, with a sign that is propped up and reads: "Survival Faire." I will be writing about this show for The (Palo Alto) Daily. Here are my notes in preparation. Misaki Kawai (born 1978 in Ōkawa, Kagawa, Japan, is a Japanese artist. · Nix & Gerber: Lori Nix & Kathleen Gerbe, Brooklyn-based duo fabricating custom models for advertising, video, film, and the web. Gregory Euclide is an artist and teacher living in the Minnesota River Valley. otherworldly: optical delusions and small realities @ Museum of Arts and Design, New York, NY. ... Bon Iver Singles. Bon Iver – Bon Iver LP. Spoke NYC,. New York, NY, United States,. Wishful Thinking. 2016. Madelyn Jordon Fine Art,. Scarsdale,. 3D Holiday. 2014. Madelyn Jordon Fine Art,. Scarsdale,. Abigail Goldman: Oh So Sorry. 2014. Trifecta Gallery,. Las Vegas, NV , United States,. Home Sweet Home. 2013. Trifecta Gallery,. Las Vegas, NV, United States,. "I currently live in Littleton with my family of nine, including me, my only, three boys, and four dogs." I am a Denver-based handmade artist creating clever little vignettes using repurposed vintage items. I shrink life down so it is magical and portable. Misaki Kawai (河井美咲) (born 1978 in Ōkawa, Kagawa, Japan) is a Japanese artist. Her work has been shown extensively in the United States. "Her father was an architect and amateur painter and her mother made clothing and puppets"  Kawai creates installations out of papier-mâché, wood, fabric, and other low-tech, "crafty" materials like felt, stickers, and yarn. She shuns expertise and uses an anime method called heta-uma that "risks amateur aesthetics by embracing basic expression"  Kawai artist book, Blueberry Express, was published by Nieves Press in 2009.
married and making art together for 24 or 25 years (23 year in Dec 2016); made 1st snow globe in 2001; live in Pennsylvania He said in 2016 video: "a successful snow globe would be absurdist humor combined with the human condition" Surreal Worlds Captured in a Snow Globe | That's Amazing when they were featured on the Theater Channel. They have also create and photograph winter scenes, exhibiting and selling the photos. Walter Martin & Paloma Muñoz. Installation View at PPOW Gallery, 2003. Recent Works · Past Works · Public Art · Photographic Series · Press · Publications · Special Editions. Public Art · Public Art · uTOPIAS · Other Works · Cross-pollination · Blind House · A Cure for all Remedies and Other Short Stories · Wax · About · News · Publications · Q + A · Press · Videos · Essays · Walter Martin Biography · Paloma Muñoz Biography · Contact · Multiples · Snowglobes · Photographs · Other Multiples · Shop. Walter Martin and Paloma Muñoz biography and art for sale. Buy art at exclusive members only pricing at the leading online contemporary art marketplace. Spanning the 40-year career of the internationally renowned Southern California-based mixed-media artist, the exhibition features large-scale multisensory installations, assemblages, sculptures, paintings, drawings, and films that invite viewers into a made-up world, a skill for which McMillen is best known. May 18, 2011 - Micheal McMillen uses just about anything he can find or that he's collected over the years to shape his art work -- work that ranges from small objects like a moth pulling a brick to giant installations that viewers can walk into and feel part of. Michael C. McMillen - WikipediaCareer. He started his career by building props for movies, where he worked in the 1970s and 1980s. ... As an artist, his work includes sculptures, art installations, and short films. Lori Nix and Kathleen Gerber are a Brooklyn-based duo fabricating custom models for advertising, video, film, and the web. Artist duo Lori Nix and Kathleen Gerber have collaborated on dioramas and miniatures for over fourteen years; their work has primarily been the subject matter f.
Opdyke: That’s fairly accurate. I did intend to be an industrial designer, more out of the fear of poverty than anything else really. After the first year, I changed my interest to painting which I soon discovered as essentially limitless, totally opposite to the dry, rational confinement of industrial design. I mean you could just paint your way into the canvas and never come out, which was exciting, but I needed something to work against. A simple way to describe it is that if you have a piece of wood and some nails, there are ways you can put them together and ways you can’t. You can invent other rules as you go along, and eventually you try to impose a set of rules on yourself—a very useful thing for me, otherwise I just go on forever. David Opdyke is a draughtsman and sculptor known for his trenchant political send-ups of American culture. Working as an architectural model maker, Opdyke had a political awakening in the early 2000s. Confronted by the horror of September 11th and America's subsequent wars, Opdyke put his technical background to use, forming critiques of Bush-era ideology. His hyperrealistic topographical models of American suburbs comment on mall culture and suburban sprawl, while his sculptures of ruined monuments mock imperialistic hubris. In these works, symbols of power and American exceptionalism, such as an astronaut and the Capitol building, are reduced to crumbling, pathetic miniatures. Opdyke's work has been exhibited at venues including the Museum of Arts and Design, MoMA PS1, and the Brooklyn Museum. http://www.magnanmetz.com/exhibitions/david-opdyke-truthful-hyperbole David Opdyke's new body of work refracts the promised glow of American democracy - once embodied in shiny optimism and irrefutable power. Coined by Tony Schwartz to describe the creative liberty taken to bolster Trump's success in his biography, The Art of the Deal, Opdyke now uses the phrase to shed dystopian light on our political landscape. Christmas in Durban mixed media diorama in Art Nouveau sterling silver jewelry box (1908). Christmas in Durban. 2017. info. ×. Gaia III mixed media diorama in reclaimed jewelry box 8.5 x 8.5 x 0.5 cm. Gaia III. 2017. info. ×. Deluge III. Joshua Smith www.iknowjoshuasmith.com/ "a former stencil artist who now creates miniature sculptures"
Official website of Joshua Smith, miniature sculpture, stencil & street artist based in Adelaide, South Australia. Joshua Smith is a miniaturist and former stencil artist based in Norwood, South Australia. With a career spanning 17 years he has showcased his work in London, Paris, Berlin, New York, Japan and all over Australia in over 100 exhibitions. Formerly a self taught stencil artist Josh refocused his career to establishing Espionage Gallery, an Art Gallery based in Adelaide, South Australia showcasing both emerging and well established local, interstate and international artists. For 4 years he showcased over 600 artists from over 20 countries. Raised on the Apsáalooke (Crow) reservation in Montana, Red Star’s work is informed both by her cultural heritage and her engagement with many forms of creative expression, including photography, sculpture, video, fiber arts, and performance. All the photos, models and everything else you see posted here are by me, Charles Young, Edinburgh. All images ©2010-2017 C Young Contact: paperholm@gmail.com. ... Crossing to Paperholm. “Launching as part of Edinburgh Art Festival, Travelling Gallery is. a graduate of the Edinburgh College of Art with both bachelor’s and master’s degrees in architecture, has spent more than three months making miniature replicas of buildings and posting them on his Tumblr, Paperholm. Each building is hand-cut from watercolor paper and glued with PVA; each GIF is hand-animated. Young started making small paper models while he was studying architecture at the University of Edinburgh. After completing his M.Arch degree last summer (2015), he eventually began Paperholm as a motivational way to test and develop his creativity and model-making skills on a daily basis. ​This blog is a place for me to save my thoughts about art, life, and more.